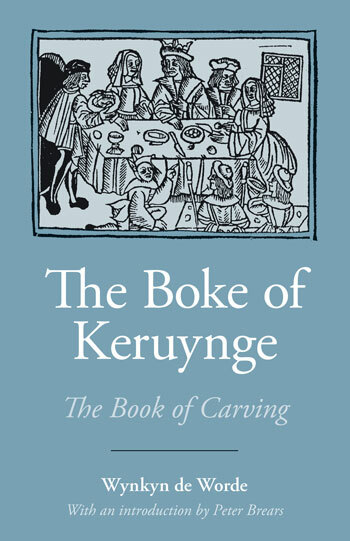 The Boke of Keruynge is a handbook or manual for well-born boys in Tudor times who had to learn how to behave at court. They were often sent to court or to a great house at an early age to be instructed, as was the experience of Sir Thomas More. The book provides instruction in arranging feasts and grand dinners, rituals of table-laying, the preparation, saucing and carving of meats and fish and servant’s duties. This was the equivalent of a ‘public school education’—a boy needed to know, for example, that clergy were to be served before noble lords, and how to lace a doublet after first warming the lord’s linen underwear before a fire. Wynkyn de Worde (Jan van Wynkyn, d. 1534) was born in Alsace and came to England in 1476. He was a printer and publisher in London known for his work with William Caxton, and was the first to popularize the products of the printing press in England. This reprint includes a facsimile of the original text from Cambridge University Library with a modern interpretation facing each page and a glossary. Preceding the facsimile is a lengthy introductory essay by Peter Brears which explains the complicated rituals involved, including the elaborate arrangements of cloths before and after the meal. The book also includes drawings and explanations, an appendix consisting of a table providing a direct means of determining the carving terms and recommended accompaniments (syrups, sprinklings and sauces) for each particular item of food, and a short summary of the life of Wynken de Worde.